Having made the quick Interstate dash down I 90-84-80-15 last June; we decided to take a more ‘scenic route’ (at least different) through Eastern Oregon and northern Nevada. We went through towns like John Day, Burns and Winnemucca. I think those were the only towns over 100 population we saw for four hundred miles! 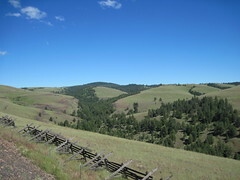 The drive through the northeastern part of Oregon was very scenic with pine covered mountains and rocky canyons. The southeastern part of the state was even more desolate than I imagined. It was scenic, with rolling hills and livestock, but there was NOBODY there. For one stretch of one hundred miles we only met three cars on the highway. We pulled into the Winnemucca Walmart before midnight and found a restful corner of the parking lot. What did you do with your soggy weekend?